Surgical operations for correcting the appearance, for changing the shape of nose, lips, ears, breast volume, and liposuction came into our lives a long time ago. However, the problem of the leg deformity can remain unsolved, causing women suffering throughout their lives. Short skirts, tight jeans, shorts and other similar clothing unfortunately become an inaccessible dream. Women (and sometimes men) suffer because of insensitive remarks and mockery. Besides the aesthetic affect, the problem also has a medical aspect. People with a strong tibial bowing (due to the incorrect load distribution on the joint), by the age of about fifty years start developing serious arthropathies which may lead to disability. 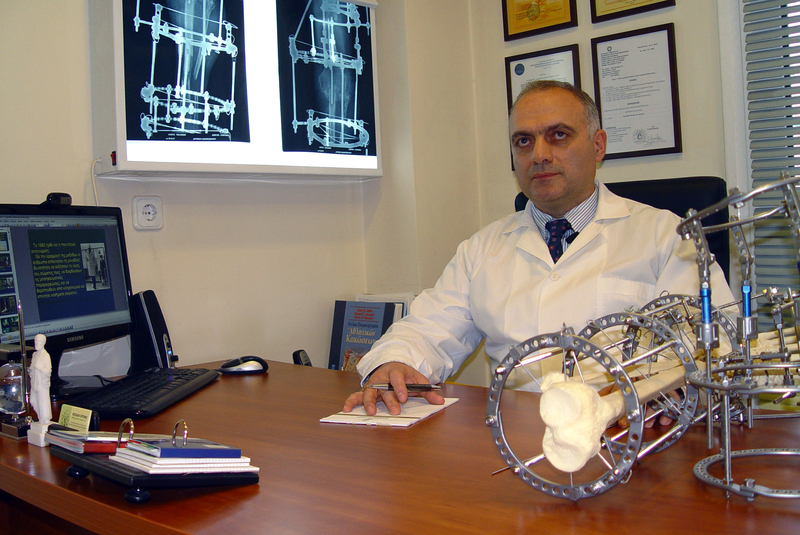 For the first time the method of limb deformity correction and lengthening was offered by a great Russian scientist born in Caucasus, named Gavril Ilizarov. In the early 1970s, the laws of tissue growth were first discovered and the first operation for bone lengthening was designed. Today this method is widely used not only in Russia, but also in many European Centers of Orthopaedics. Due to the significance and prevalence of the pathology, during the recent years, many orthopaedists have identified this method as a separate field called “Plastic orthopaedic surgery”. The origins of plastic surgery date back to ancient Egypt, where the doctors had been practicing operations for the correction of “harelip” and amputated (for whatever reason) noses. In ancient times similar methods were used by the healers of Persia and Arabia. 600 years B.C. in India there were frequent inter-tribal wars, and the prisoners had their noses cut in order to be easily distinguished within the crowd of people. Thus the reconstruction of the nose was a serious and urgent problem for the people of such eastern countries. Time has preserved even the exact name of an Indian doctor who described the operation, Sushat Samgit. Modern leg deformity correction operations are performed under general or regional anesthesia. At the first stage, above or below the intended incision on the tibia, special pins are placed, which are fixed on rings, which, in turn, are arranged into the Ilizarov apparatus. At the second stage the doctor cuts the leg bone at the top of its bending and simultaneously or gradually performs the correction. When elongation is required, the deformity angle correction and the lengthening are made simultaneously. On the second post-operative day, patients usually begin to walk with crutches. A month later, there is no need for crutches and patients can walk with full weight-bearing. In case of leg lengthening the patient must tighten some nuts of the unit 4 times a day. The bone growth rate one millimeter per day in average. The period of regeneration and maturation of the newly formed bones range from three to five months. After removing the apparatus the patients are advised to avoid strenuous exercise and heavy physical activity. A patient, 22 years old medical student, was operated because of the varus deformity of lower extremities. During the operation, performed with the Ilizarov apparatus, I performed tibial osteotomies with gradual correction of deformity and 3 cm lengthening. The duration of treatment was five months. The patient was satisfied with the results of the treatment.